I was looking for an appropriate quote to describe Angkor Wat and what it is like to see it in person, but I couldn’t find anything suitable. It is an amazing sight and one that makes you wonder how this type of structure was even possible to construct so long ago. We have seen some incredible temples and landscapes on our trip so far, specifically Bagan in Myanmar. 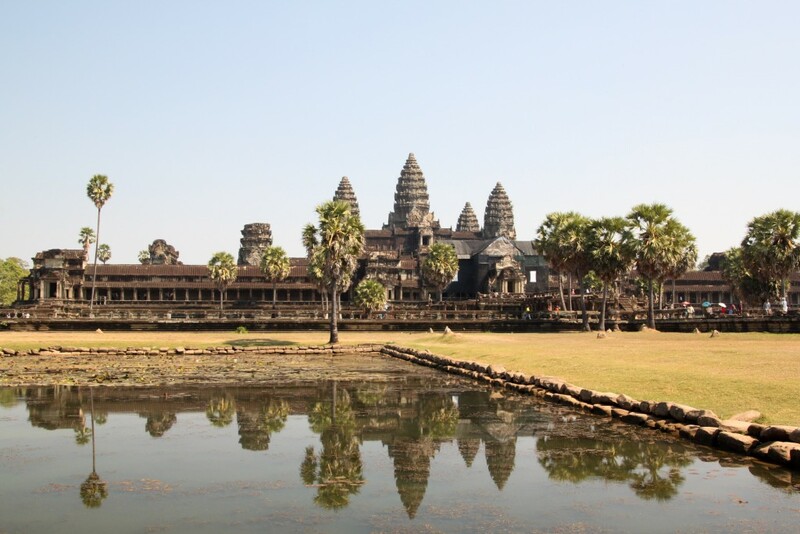 However, as a single structure or temple, Angkor Wat easily stands out above the rest. Angkor Wat (in Khmer – ‘Temple City’) was built in the 12th century and was left untouched and abandoned for hundreds of years. It has undergone various restoration efforts upon its discovery in the 19th century and those efforts continue today. 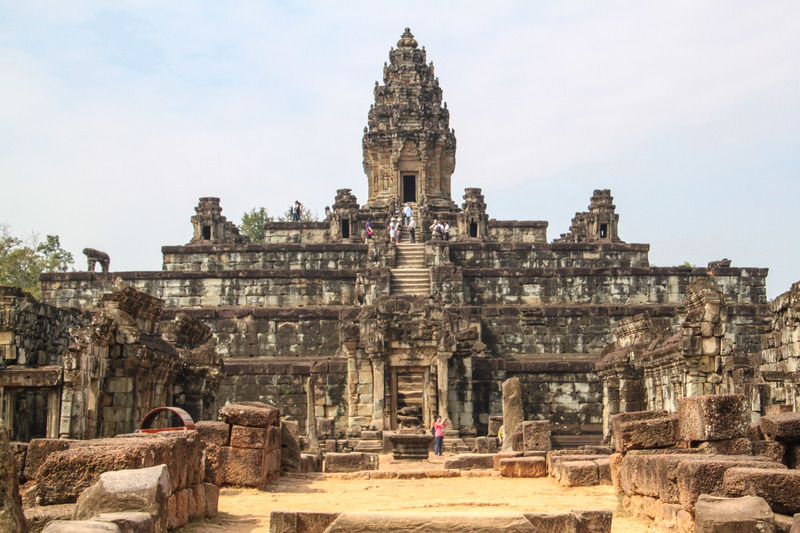 In recent years, Angkor Wat and other temples in the Angkor region have seen increased tourism, which can cause significant damage if it is not preserved and done in the right way. It appears these efforts have saved quite a few of the temples from completely crumbling, but it would be a shame if the influx of tourists ends up being the cause of even greater damage. 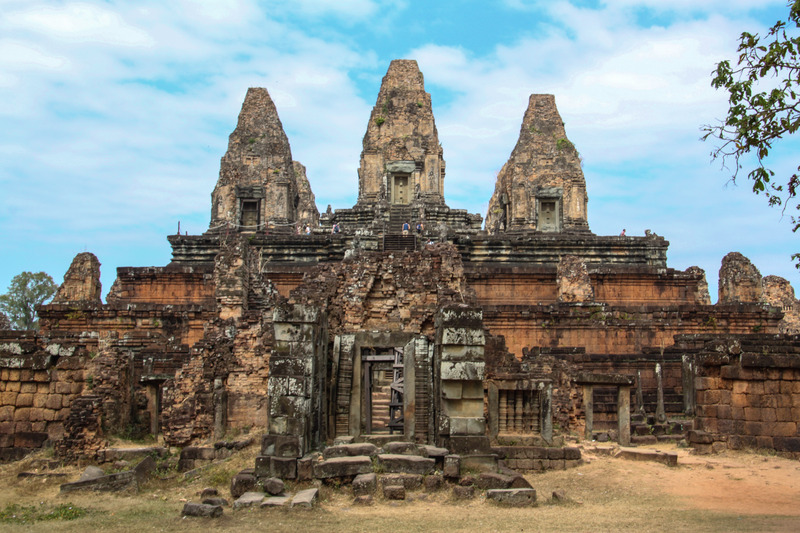 A person is probably drawn to Cambodia and Siem Reap because of Angkor Wat (and rightfully so), but there is so much more to see that will leave you speechless. 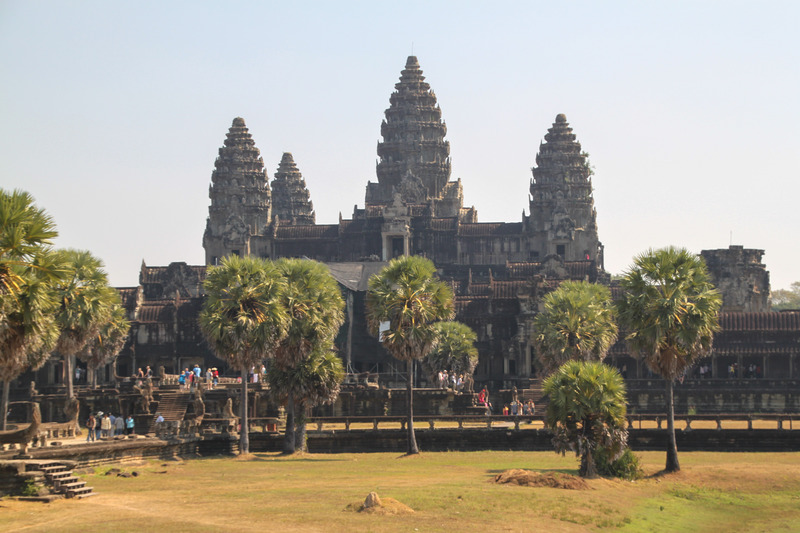 We bought a 3-day pass to tour Angkor ($40 USD per person) at a more relaxed pace, which we would highly recommend. In case you are confused, Angkor is a region of Cambodia near Siem Reap that has over a thousand temples, of which Angor Wat is the centerpiece. Alana and I decided we didn’t want to fight the crowds at Angkor Wat at sunrise; we had heard less than great things about dealing with people there in morning. Upwards of 3,000 people head to Wat for sunrise. We wanted to find a spot that would offer us some quiet and a more relaxed environment. We decided on Angkor Thom and specifically Bayon Temple for sunrise and were extremely happy with our decision. Including us, there were only a handful of people there in the morning and it was neat to take our torches (flashlights) in the pitch black and climb around in the temple. You could hear bats and lots of other animals in the dark, which was both nerve-racking and exhilarating. Basically, if the squeaking got louder as we walked, we kept our heads down and moved quickly. Bakong Temple is a place we heard is an absolute must, especially for catching a great sunset. 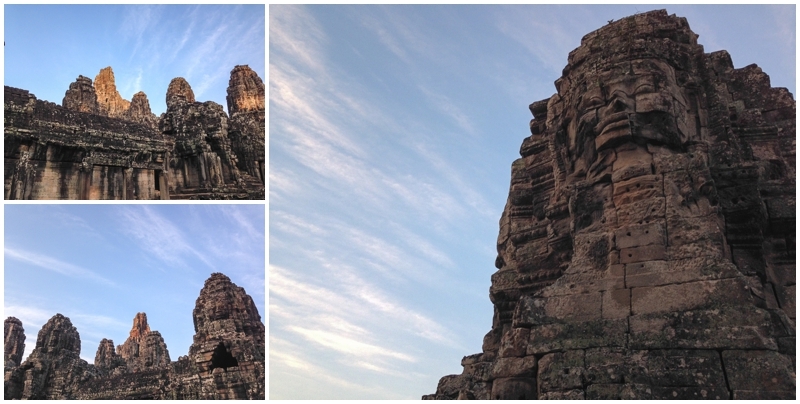 Again, Angkor Wat is the main attraction for sunsets, but Bakong apparently has a fantastic view and is less crowded. Unfortunately for us, we saved Bakong for our last day of our 3-day Angkor pass. It was unfortunate because we both got extremely sick from food during the week and were complete wrecks that day. We only visited two temples our last day and did not make it to sunset that evening either. We still managed to enjoy ourselves, even though neither of us wanted to be anywhere except bed. This was one of the few pictures that turned out from East Mebon. We had a mishap with our camera, basically, make sure your battery is charged. A lesson learned I think. 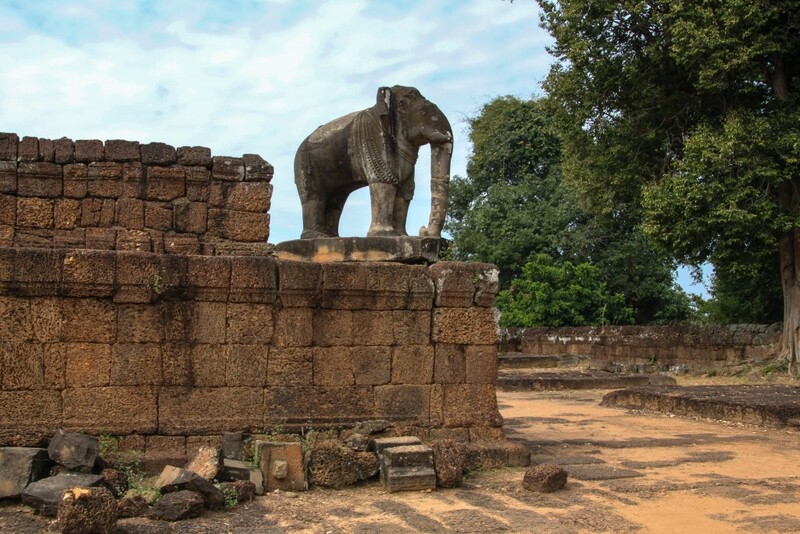 Pre Rup was where the beginning of our sicknesses started, so it was a bit of a blur. Sorry for the lack of description here. 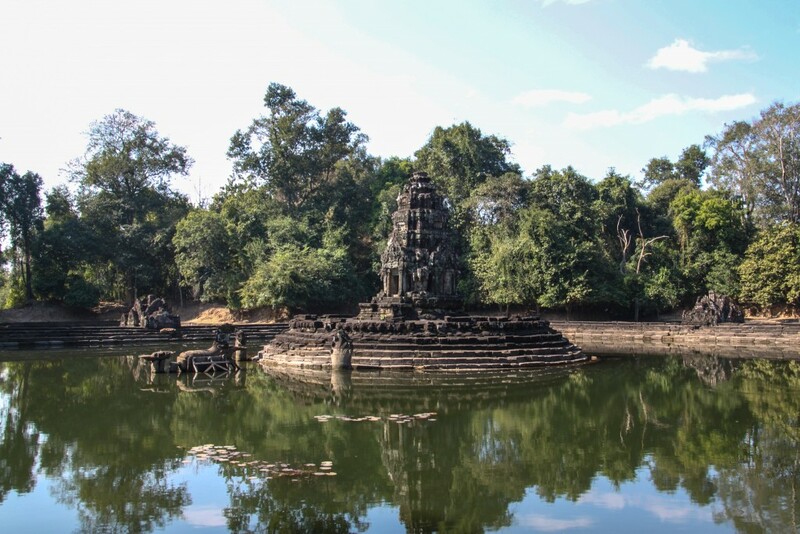 Neak Pean is known as the island temple. 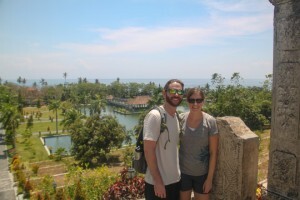 It is built on a man made island, accessible by walking across a long bridge which crosses a man made lake. It was good to see a different type of temple structure in comparison to most we visited. This was one of Alana’s favorite temples, only partially because it reminded her of the game show Legends of the Hidden Temple, for those who grew up in early 90’s watching Nickelodeon. Ok, I’ll admit it, I always wanted to be on the show too. Go Barracudas! Aside from wanting to run around the temple re-enacting scenes from the show, it was interesting to see the different parts of the temple left untouched that have not been restored. The other temple (along with Bakong) we visited on our final Angkor tour day. Again, we were feeling absolutely terrible, but we didn’t want to waste an entire day in bed or the last day of a pass we already paid for in advance. 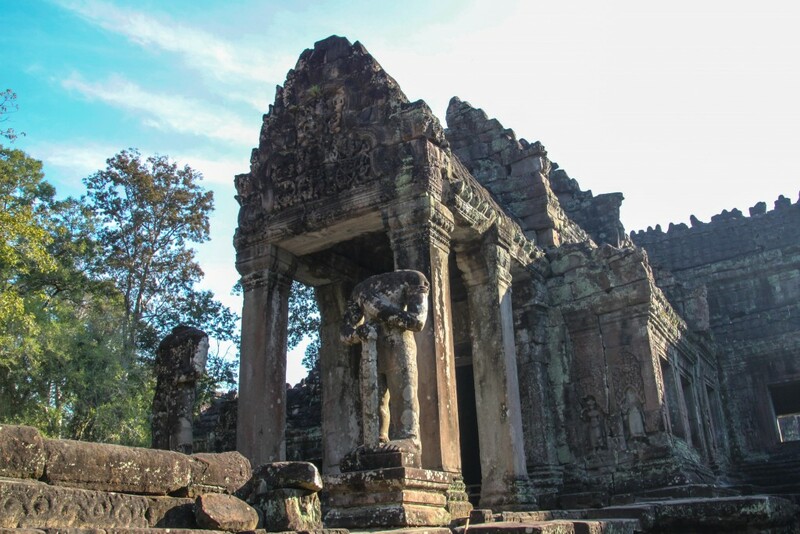 This temple appeared to be in extremely rough shape after hundreds of years of battling the elements. Speaking of the elements and the toll they can take on man made objects. 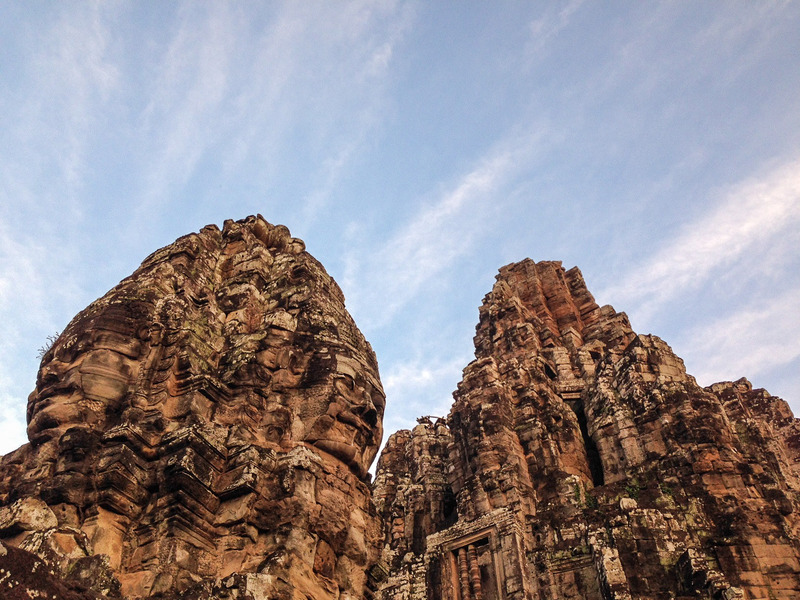 Ta Som Temple is a great example of natures power versus man. After walking through the main portion of the grounds, near the back is an entryway that has been completely overtaken by tree roots. 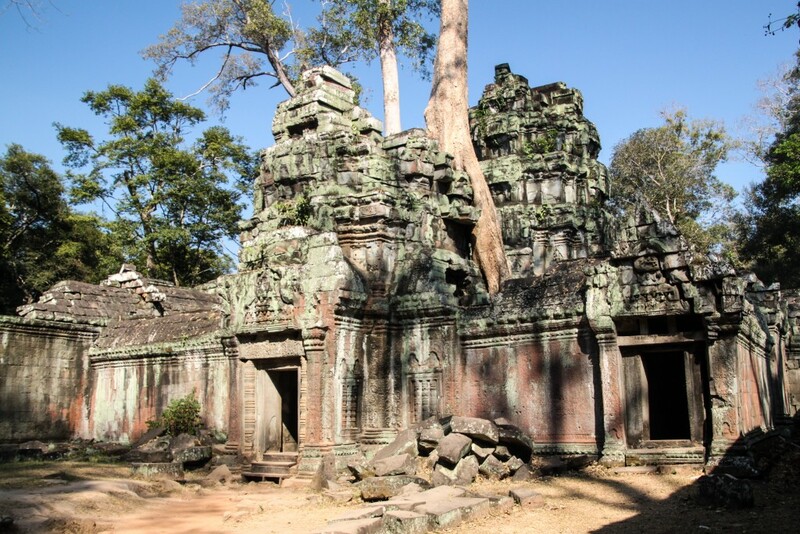 Another example of nature and the destruction it can cause is at Ta Prohm Temple. This temple has had very little done to it in terms of restoration, as it was so overtaken by trees and jungle vegetation. The most distinctive feature of Ta Prohm is of course the trees that have grown right through the ruins. For those who are up on their pop culture, Ta Prohm is the location used in the filming of the movie Tomb Raider starring Angelina Jolie.